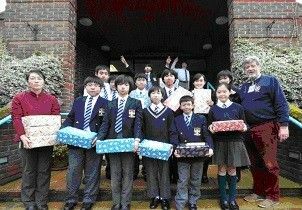 One again, the scale of response to our joint appeal for gift-filled shoeboxes has been truly marvellous, highlighting the generosity of schoolchildren and residents of Cranleigh and surrounding areas. 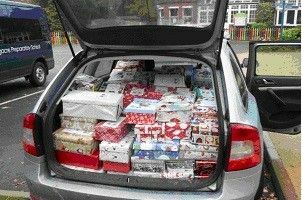 This year we collected almost 1,100 boxes from 10 local schools, plus around 300 boxes donated by, in particular, parishioners of St. Nicolas Church, as well as members of the public and some local businesses. Each of the boxes will certainly enhance the quality of Christmas for so many of the deprived and disabled children in Hunedoara, western Romania. In addition, the process of selecting and packing the wide range of gift items undoubtedly created a strong feel-good factor among everyone who participated in this most charitable exercise. Indeed, that sense of pride was clearly evident amongst those children we met when collecting the boxes, regardless of whether they contributed a 'handful' of boxes or, as in the case of two schools, more than 250 each! The Cranleigh-area gifts were supplemented by those from various centres in south-eastern counties, and so the overall number of boxes (plus some suitcases full of household items and clothes) despatched from Cranleigh on 18 November was almost 1,800. 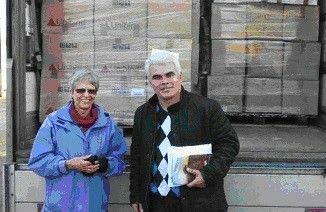 The boxes were picked up in Cranleigh by Pastor Corneliu Medrea, who, together with his wife Diana, set up the Bethlehem Centre (www.betelccb.ro) in Hunedoara, western Romania, in the 1990's. As well as conducting Christian activities, the centre seeks to develop practical projects to meet the dire physical and material needs of those around them. They have used their received aid over the years to create not only a community social-care centre, but also to provide hygiene facilities for children in families with no running water or electricity, as well as a daily meals programme for children with little or no food. The donated shoeboxes will be distributed to children in the Hunedoara area just before Christmas. Below is a selection of photos that show school collections, sorting, packing and truck-loading prior to the long journey to Romania. Cranleigh organiser Ruth Collins is shown with Pastor Corneliu from Romania.